Franklin Rafael Gutierrez…resides in Boca Raton, FL with wife, Vivian and son…father-in-law is former Major Leaguer Luis Salazar…signed by Dodgers on November 18, 2000 by scout Camilo Pascual. Spent the entire campaign with the Mariners, hitting .246 with nine doubles, 14 homers and 39 RBI in 98 games...Posted a .280/.373/.511 slashline with 12 homers and 32 RBI against left-handed pitchers…tied for second among American League leaders with 12 homers and sixth in RBI against lefties...Appeared in 64 games at right field and nine games in left field, while not committing an error in 475.2 innings...Drove in a career-high six runs and tied his career mark with two homers against the Red Sox on June 17. Totals - Hit .292 (50x171) with 27 runs, 11 doubles, 15 home runs, 35 RBI & .620 slugging mark in 59 games with Seattle. ... Defensively - Appeared in left field (42 G, 36 GS) right field (4 G) & DH (6 G, 6 GS). ... Packing Power - hit 15 home runs in 171 at-bats…his 11.40 AB/HR ratio was the 5th-best in club history (min. 15 HR) behind Ken Griffey Jr. (10.83 in 1994, 10.86 in 1997, 11.12 in 1996 & 11.30 in 1998)…2ndbest AB/HR ratio in MLB (Miami's Giancarlo Stanton, 10.33). ... Finishing Strong - Hit .309 (34x110) with 22 runs, 6 doubles, 12 home runs and 27 RBI in his final 35 games (Aug. 4-end of season)…in first 24 games hit .262 (16x61). ... Part-Time Power - His 15 home runs from July 7 on were T15th in the American League & 3rd on team behind Nelson Cruz (23) & Robinson Cano (16). ... Pinch-Hit Slam - Hit pinch-hit grand slam July 21 at Detroit…was second pinch-hit grand slam in club history joining Ben Broussard on April 21, 2007 at LAA (off Scot Shields). ... Welcome Back - Selected from AAA Tacoma on June 24. ... AAA Tacoma - Hit .317 (57x180) with 34 runs, 12 doubles, 7 home runs and 31 RBI in 48 games with the Rainiers, appearing in games in left field (29) and designated hitter (18). ... MiLB Streaking - PCL-best 20-game hit streak May 22-June 17 (.370/30x81). Placed on MLB Restricted List on Feb. 12 and did not play in 2014…played for Caracas in VWL…hit .222 (8x36) with 5 runs, 5 doubles, 2 home runs and 4 RBI. Placed on the MLB Restricted List on Feb. 13, 2014 and will not play in 2014. Missed 106 games in two DL stints with a strained right hamstring, April 23-June 21 & June 25-Aug. 25. Reached double-digits in home runs (10) for the first time since 2010, despite appearing in only 41 games. Averaged 14.50 at-bats per home run, the 6th-best ratio in the Majors by players with 10 or more home runs. Hit a team-high 3 leadoff home runs, all coming in the month of April (4/3 at OAK, 4/5 at CWS, 4/11 vs. TEX)…tied Rickey Henderson (May 2000) for most leadoff HR in a month in club history. Homered in his first game back from the DL on June 22 vs. Oakland…was active for only 2 games before returning to the DL. Returned from the DL on Aug. 26 and hit .235 (20x85) with 3 doubles, 5 home runs, 13 RBI and 2 stolen bases in his final 23 games. 17 of his 36 total hits went for extra bases (7 2B, 10 HR). Appeared in 47 games on rehab assignment with AAA Tacoma, batting .211 (41x194) with 16 doubles, 3 home runs and 25 RBI. Over last 3 seasons appeared in 173 of 486 team games, with 6 trips to the disabled list. Appeared in 40 games,making 38 starts (all in CF)...hit .260 (39x150) with 18 runs,10 doubles, 1 triple, 4 homeruns and 17 RBI ... Hit .400 (26x65) with 7doubles, 1 triple, 4 HR, 13 RBI,.723 SLG vs. LHP (.153/13x85vs. RHP) ... Committed an error on Sept.11 at Toronto (dropped flyball), his first since Aug. 20,2009...went 301 consecutive games in the outfield (293 GS) without an error, a streakthat included an American League record 846 consecutive chances...the previous ALrecord was 723 consecutive errorless chances by Darin Erstad, and fell short of the MLBrecord of 938 by Darren Lewis ... Placed on 7-day (concussion) disabled list on June 29-Aug. 27 after being hit on head byerrant pick-off throw at first base June 28 vs. Boston ... Tied career-high with 4 hits June 22 at San Diego (also: 7/16/07 vs. CWS), going 4-for-5with 2 runs, 1 home run and 2 RBI ... Hit pinch-hit 3-run home run in 8th inning June 20 at Arizona (pulled Seattle to within 14-10); first pinch-hit home run of his career ... On disabled list March 28 (retro to 3/24)-June 13 with a partial tear in his right pectoralmuscle (suffered 2/28 in spring training) ... Over last two seasons appeared in only 132 of 324 Mariners games due to four separatetrips to the disabled list. Appeared in 92 games, making 85 starts in centerfield...hit .224 (72x322) with 26 runs, 13 doubles, 1 home run and 19 RBI...Missed remainder of season after being placed on 60-day disabled list Sept. 6 with a strained left oblique...Holds the American League record for most consecutiveerrorless chances (786) by an outfielder (passed Darin Erstad, 723 errorless chances,May 30, 2001-Sept. 22, 2002)...has not made an error since Aug. 20, 2009, a span of 279consecutive games (271 GS)...the MLB record is 938 consecutive errorless chances and392 consecutive games, both held by Darren Lewis (Aug. 21, 1990-June 29, 1994 withOAK & SF)...AL record for consecutive errorless games by OF is 336 by Rich Amaral...Did not commit an error in 92 games (244 total chances), his 2nd consecutive seasonwithout committing an error...Hit .282 (35x124) with 12 runs, 8 doubles and 10 RBI over his final 33 games, July 31-Sept. 4...began season hitting .187 (37x198) in his first 59 games...Tied for team lead with 7 outfield assists (with Ichiro) despite appearing in only 92 games...Hit .248 (40x161) on the road, compared to .199 (32x161) at Safeco Field...Tied a career-high with 5 consecutive multi-hit games Aug. 8-13 (also: 2009)...On disabled list March 30-May 18 with stomach gastritis...missed first 41 games...Appeared in 11 games with AAA Tacoma on rehab (.275/11x40, 7 R, 2 2B, 2 3B, 6 RBI). Earned first Gold Glove...set Major League record by finishing the season with 415 errorless chances in the outfield, besting the previousrecord (Curt Flood, STL, 396 in 1966)...is 1st Mariners outfielder to finish the season with a 1.000 fielding percentage (min. 108 games)...Led Mariners with 64 RBI, T1st in triples (3), 2nd in home runs (12), walks (50), 3rd in steals (25), runs (61), doubles (25)....Stole a career-high 25 bases, just the 5th Mariners center fielder with 25+ steals (7x, M.Cameron, 2x; Ichiro, 2x; Ruppert Jones; Henry Cotto)...Had a season-high 8-game hitting streak April 5-12 batting .419 (13x31)...also hadstreaks of 7 (Aug. 8-15), 6 (April 14-20) and 5 (Aug. 17-22)....Hit .326 (29x89) with 9 runs, 4 doubles, 2 triples, 2 home runs, 13 RBI in April, but just.230 (110x479) over his final 129 games (May 1-Oct. 3)....Hit home runs in back-to-back games April 24-25; 4th time in his career....Drew a walk in 9 consecutive games May 7-18, 4th longest in club history (J. Buhner, K.Griffey, G. Thomas, 10)....Walk-off 2-RBI single to center on July 21 vs. White Sox (B. Jenks) in bottom of the 11thinning scored Josh Wilson & Chone Figgins....Recorded a season-high 3 hits six times: April 10 at TEX, April 16 vs. DET, May 4 vs. TB,July 21 vs. CWS, Aug. 30 vs. LAA, Sept. 14 vs. BOS....Game-winning RBI in 1-0 win on June 20 vs. Cincinnati with sacrifice fly in 4th inning....Tied career-high with two 3-run games (5/21 vs. SD, 5/25 vs. DET)....Missed 2 games (May 12-13) with stiff muscle in upper back. Set career highs in games (153), at-bats (565), runs (85), hits (160), home runs (18) and RBI (70)...Earned Fielding Bible Award as best fielding center fielder in baseball...Hit .335 (55x164) batting average against left-handers,ranking 10th in the AL...Hit .317 (90x284) with 51 runs, 12 doubles, 7 home runs, 38 RBI, .386 OBP at home...Became just the 9th player in club history to record a season of at least 15 HR and 15stolen bases...Led Major League outfielders with 445 putouts, 3rd with .921 zone rating and had 6outfield assists...his putouts ranked as 4th most by a Mariners outfielder behind MikeCameron (485 in '03) and Ruppert Jones (465 in '77, 453 in '79)...June 23-end of season hit .301 (108x359), 57 runs, 18 doubles, 12 HR, 46 RBI, .802 OPS...Career-high 13-game hitting streak June 26-July 10; during streak hit .462 (24x52) with8 runs, 4 doubles, 3 home runs and 12 RBI...had 6 hitting streaks of at least 5 games...Had a career-high 5-straight multi-hit games April 29-May 4...Ranked 10th in American League with .351 average in July with 5 home runs, 17 RBI...Scored 39 runs in his final 58 games of the season, scored 46 in first 95 games...his 85runs scored were 3rd most in the American League by a center fielder...First career multi-homer game June 18 at SD...hit 4 of his 18 home runs against Padres...Hit 2-run home run in first game with the Mariners on Opening Day, April 6 at Minnesota...Ranked 2nd in the American League with 13 sacrifice bunts, one behind the leader...Left game June 10 at Baltimore with a left knee contusion, missing 2 games due to injury...In his final 15 games of the season hit .350 (21x60) with 13 runs, 5 doubles, 2 home runs,10 RBI, .918 OPS including 7 multi-hit games...Hit .331 (55x166) with 26 runs, 9 doubles, 9 home runs, 28 RBI with .372 OBP, .548 SLGin 43 games while batting 5th or 6th in the lineup. Set career-highs in nearly every offensive category, including games (134), hits (99), doubles (26), RBI (41) and extra base hits (36)...From Aug. 17 through the end of the season he hit .318 (34x107) with 7 doubles, 2 home runs and 16 RBI in 34 games...raised his average from .223 to .248 during the stretch...Overall on the year made 85 starts in right field (97 G), 8 starts in left field (11 G) and 11 starts in center field (12 G)...Ranked 16th among all AL outfielders in fielding % (.989, 3 E, 276 TC)...Scuffled in the middle of the year, hitting .200 (11x55) in May, .173 (9x52, 2RBI, 20G) in June and .155 (9x58, 3RBI, 19G) in July...average on July 31 was .210 and was 0-for-32 from June 15-July 8 (longest since Pat Tabler 0x33 in 1987)...Over the last two months of the season hit a combined .313 (46x147) with 12 doubles, 4 home runs and 20 RBI in 47 games...Recorded career-long 10-game hitting streak from Sept. 7-16...hit .360 (18x50) with 3 2B, 4 RBI in last 17 games of the season (since Sept. 7)...His OPS (OBP + SLG) in the first half was .579 compared to .816 in the second half...Hit his first career grand slam and drove in a career-high 4 RBI May 27 vs. Chicago (Mark Buehrle)...Hit his first career leadoff home run Aug. 6 at Tampa Bay...Swung at the first pitch 11.8% of the time, 5th-lowest percentage in the AL. Spent most of the season in Cleveland, becoming the club's regular right fielder over the second half of the season... Was a versatile, consistent presence over the last 4 months of the season ... Made 59 starts in right field (88 games), 7 starts in left field (9G) and 2 starts in center 'field (8G) ln the 2nd half he hit .260 (53-204) with 12 2B, 9 HR & 27 RBI in 66 games...Was 4 for 9 as a PH... Had acareer-high 4 hits on July 16 vs. Chicago-AL, going w/a 2B, HR and career-high tying 3RBI ... Hadthree games of 3RBI, last coming on August 22 at Detroit. ..From June 14 thru the end of the seasonhe hit .279 (68-244) w/11 HR & 33RBI in 84 games for Cleveland ... From Sept. 6 thru the end of theseason he hit .271 (19-70) with 3 HR & 9 RBI in 22 games to end the season ... Homered off the likesof Josh Beckett, Javier Vazquez, Justin Verlander & Kelvim Escobar. ..Was with the Major Leagueclub from May 6-19 and from May 31 thru the end of the season... Hit .264 (37-140) with runners onbase ... BUFFALO· Began the year on the 15-day Major League disabled list after injuring his lefthamstring running on the bases on March 22...Was his first career trip to the Major League DL.Was activated and optioned to Buffalo on April 13... While at AAA Buffalo Franklin hit .341 (44-129)with 7 2B, 4HR & 16 RBI in 30 games... He has also stolen 7 bases and scored 29 runs in the 30games, hitting mainly in the lead-off spot in the order. ..At Buffalo he has hit .361 (13-36) off LHP and.387 (12-31) with RISP while his .341 average was 4th best in the International League at the time ofhis May 31 recall ....He hit in 19 straight games from April 16 thru May 21 and hit safely in 27 of his30 Triple A games... Hit .387 (12-31, HR, 13RBI) with RISP and .357 (5-14, 5RBI) with RISP/2 outs ... Made 13 starts in CF, 15 in RF, 1at DH. Split the season between AAA Buffalo and the big leagues, spending three stints in Cleveland...Was with the Indians from June 16 to July 13, August 9-25 and Sept. 5 thru the remainder of the season... Collected his first Major League hit on June 17 @MIL off Dave Bush and hit his first homer on August 13 off KC's Andy Sisco inJacobs Field...Collected a career-high 3 hits on July 7 vs. Baltimore and had a career/season-high 8-game hitting streak fromJune 26-July 4 (.370, 10-27)...With the Indians he made 24 starts in RF (28G), 10G/GS in LF and 7G/2GSin CF...From June 26 thru the rest of his big league tenure he hit .309 (34-110) with 9 2B, 1HR & 8RBI in 35games...From August 20th on he hit .327 (17-52) with Cleveland...With the Indians he hit .262 (11-42) off LHPand .277 (26-94) off RHP...Hit .302 (16-53) with runners on and .270 (10-37) in September... Hit leadoff in 89 of his 90 games and hit .320 (33-103) off LHP w/4HR & 14RBI...Led-off 2 games w/homerswith the AAA Bisons... Hit a grand slam on June 7 vs. Toledo...Only month above .300 came in April (.309,29-94, 2HR, 8RBI)...Led the team with 49 walks despite playing in 90 games...Made 58 starts in CF, 18 in LF,9 in RF, 5 at DH. Gutierrez spent most of the season with Double-A Akron, though he spent the final weeks of the Minor League season at Buffalo. A September callup, Gutierrez, a native of Venezuela, got one at-bat and went hitless. The Indians didn't play him in the field, though his speed did help in pinch-running situations. Was acquired by the Indians prior to the season for OF Milton Bradley and was assigned to AA Akron after the transaction...Entering the season he was rated the #3 prospect in the LA Dodgers organization and was recognized by Baseball America as the best power hitter in the Dodgers organization...Was named by Sportsticker prior tothe season as the 4th best outfield prospect in minor league baseball.Spent most of the season at AA Akron, but was limited to 77 combined games at Akron and AAA Buffalo due toa strained ligament in his right throwing elbow...Hit over .300 in each of his full three months at AA Akron (April,May, June)...Hit in 9 straight games from May 6-15 and hit in 19 of 22 games from April 28 to May 20 to raisehis average from .277 to .325...Had four straight 3-hit games, June 13-17 (12 for 19), with 2 2B, 2 3B, 1HR &10RBI...Had a HR & 5RBI on June 15 vs. Binghamton...DH'd on June 19 as he elbow began to bother him andwas promoted to AAA Buffalo on June 22 to get regular at bats as the DH.With Buffalo he appeared in 7 games and hit safely in 3 of them...Hit his 1st career Triple A homer on June 24vs. Durham...Was placed on the disabled list on July 2 after persistent right elbow pain and remained on the DLuntil being activated on Sept. 1 at AA Akron (2 for 13)...Reported to the Florida Instructional League after theseason in good health and hit .277 (57-206) in the Venezuelan Winter League after the season with 14 2B, 13HR& 36 RBI in 53 games for Caracas...3rd in VWL in HR and 2nd with 29 EB hits. In a combined 128 games for Vero Beach (A) and Jacksonville (AA), batted .287 (141x492) with 31 doubles, 7 triples, 24 home runs and 80 RBI...named the Dodgers Minor League Player of the Year...rated as the 4th-best prospect in the Florida State League by Baseball America...spent most of the year at Vero Beach, ranking 2nd in theFSL in slugging % (.513), home runs (20) and total bases (218), and 3rd in extra base hits(53)...represented the World Team in the Futures Game in Chicago...played in the FloridaState League All-Star Game...selected to the FSL Post-Season All-Star Team and theTopps Class A All-Star Team...named to the FSL Baseball America High Class A All-StarTeam...hit six homers over the first 6 games of the season...named FSL Player of theWeek, April 3-13, batting .354 (17x48) with 7 home runs, 12 runs scored and 17 RBI...hit.325 with 8 homers and 29 RBI in April to earn Topps FSL Player of the Month honors. Spent most of year at South Georgia (A) of the South Atlantic League before ending season with 2 games in Las Vegas (AAA)...stole 13 bases in 17 attempts at South Georgia. October 12, 2018 OF Franklin Gutierrez assigned to Leones del Caracas. November 2, 2017 LF Franklin Gutierrez elected free agency. August 4, 2017 Los Angeles Dodgers transferred LF Franklin Gutierrez from the 10-day disabled list to the 60-day disabled list. Anklyosis spondylitis. June 25, 2017 Los Angeles Dodgers placed LF Franklin Gutierrez on the 10-day disabled list. Anklyosis spondylitis. May 2, 2017 Los Angeles Dodgers activated LF Franklin Gutierrez from the 10-day disabled list. April 29, 2017 Los Angeles Dodgers sent CF Franklin Gutierrez on a rehab assignment to Rancho Cucamonga Quakes. April 12, 2017 Los Angeles Dodgers placed LF Franklin Gutierrez on the 10-day disabled list retroactive to April 11, 2017. Left hamstring strain. February 20, 2017 Los Angeles Dodgers signed free agent LF Franklin Gutierrez. November 3, 2016 RF Franklin Gutierrez elected free agency. November 11, 2015 Seattle Mariners signed free agent RF Franklin Gutierrez. November 2, 2015 LF Franklin Gutierrez elected free agency. June 24, 2015 Seattle Mariners selected the contract of LF Franklin Gutierrez from Tacoma Rainiers. April 7, 2015 CF Franklin Gutierrez assigned to Tacoma Rainiers. January 26, 2015 Seattle Mariners signed free agent CF Franklin Gutierrez to a minor league contract and invited him to spring training. December 8, 2014 OF Franklin Gutierrez assigned to Leones del Caracas. October 30, 2014 CF Franklin Gutierrez elected free agency. October 30, 2014 Seattle Mariners activated CF Franklin Gutierrez from the restricted list. February 13, 2014 Seattle Mariners placed CF Franklin Gutierrez on the restricted list. 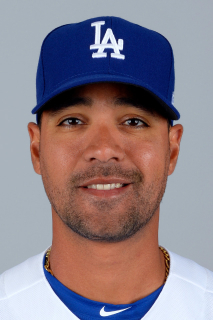 December 18, 2013 Seattle Mariners signed free agent CF Franklin Gutierrez. November 1, 2013 RF Franklin Gutierrez elected free agency. August 26, 2013 Seattle Mariners activated RF Franklin Gutierrez from the 15-day disabled list. August 11, 2013 Seattle Mariners sent CF Franklin Gutierrez on a rehab assignment to Tacoma Rainiers. July 18, 2013 Seattle Mariners sent CF Franklin Gutierrez on a rehab assignment to Tacoma Rainiers. June 25, 2013 Seattle Mariners placed CF Franklin Gutierrez on the 15-day disabled list retroactive to June 24, 2013. Strained right hamstring. June 22, 2013 Seattle Mariners activated CF Franklin Gutierrez from the 60-day disabled list. June 22, 2013 Franklin Gutierrez roster status changed by Seattle Mariners. June 12, 2013 Seattle Mariners sent CF Franklin Gutierrez on a rehab assignment to Tacoma Rainiers. June 5, 2013 Seattle Mariners transferred CF Franklin Gutierrez from the 15-day disabled list to the 60-day disabled list. Strained right hamstring. May 16, 2013 Seattle Mariners sent CF Franklin Gutierrez on a rehab assignment to Tacoma Rainiers. April 23, 2013 Seattle Mariners placed CF Franklin Gutierrez on the 15-day disabled list. Strained right hamstring. November 19, 2012 CF Franklin Gutierrez assigned to Leones del Caracas. November 19, 2012 Franklin Gutierrez roster status changed by Leones del Caracas. August 27, 2012 Seattle Mariners activated CF Franklin Gutierrez from the 15-day disabled list. July 13, 2012 Seattle Mariners placed CF Franklin Gutierrez on the 15-day disabled list. June 13, 2012 Seattle Mariners activated CF Franklin Gutierrez from the 15-day disabled list. June 2, 2012 sent CF Franklin Gutierrez on a rehab assignment to Tacoma Rainiers. March 28, 2012 Seattle Mariners placed CF Franklin Gutierrez on the 15-day disabled list retroactive to March 24, 2012. Partial tear of his right pectoral muscle. March 27, 2012 Franklin Gutierrez roster status changed by Seattle Mariners. October 31, 2011 Seattle Mariners activated CF Franklin Gutierrez from the 60-day disabled list. September 6, 2011 Seattle Mariners placed CF Franklin Gutierrez on the 60-day disabled list. Strained left oblique. May 18, 2011 Seattle Mariners activated CF Franklin Gutierrez from the 15-day disabled list. May 2, 2011 High Desert Mavericks sent DH Franklin Gutierrez on a rehab assignment to Tacoma Rainiers. April 15, 2011 sent CF Franklin Gutierrez on a rehab assignment to High Desert Mavericks. March 30, 2011 Seattle Mariners placed CF Franklin Gutierrez on the 15-day disabled list retroactive to March 22, 2011. Stomach gastritis. October 7, 2009 CF Franklin Gutierrez assigned to Leones del Caracas.